HDL stands for Hardware Description Language. This website also contains information on various Verilog/FPGA tutorials, Alternative Energy projects, and the progress of a new CPU architecture that I'm designing. I'm an electronic design engineer specializing in contract Verilog RTL FPGA design, functional verification, testbench creation, simulation and debug. I have a varied background in other disciplines too. This new dynamic instruction scheduling algorithm is not like the typical OoO methods being used today and the goal is to improve OoO IPC. Most Modern Out of Order CPU's, either use the Tomasulo or Scoreboarding algorithm (or some variant) for dynamic instruction scheduling. The method used in this CPU is completely different and simpler although there are several very specific rules it follows. There is no CDB or multiple CDBs, but multiple FU's that can execute in parallel in the same clock cycle. There is no register renaming, as the method effectively has infinite renaming, and thus no physical register set, just the architectural registers. It appears that as IPC increases linearly, the logic for the this new algorithm grows fairly linear instead of exponentially like the Tomasulo algorithm. The goal of building a working CPU is to prove the method works and to vary design parameters to get maximum performance (IPC throughput) for a given microarchitecture. The design is highly parameterized to allow many variations in the design. The latest design is now written in System Verilog RTL. 4/27/2017 - Since this algorithm can be applied to most any ISA, I am switching from the ARMv7 ISA to the RISC-V (RV32IM). RISC-V will be simpler to implement and there is software tool support for it. 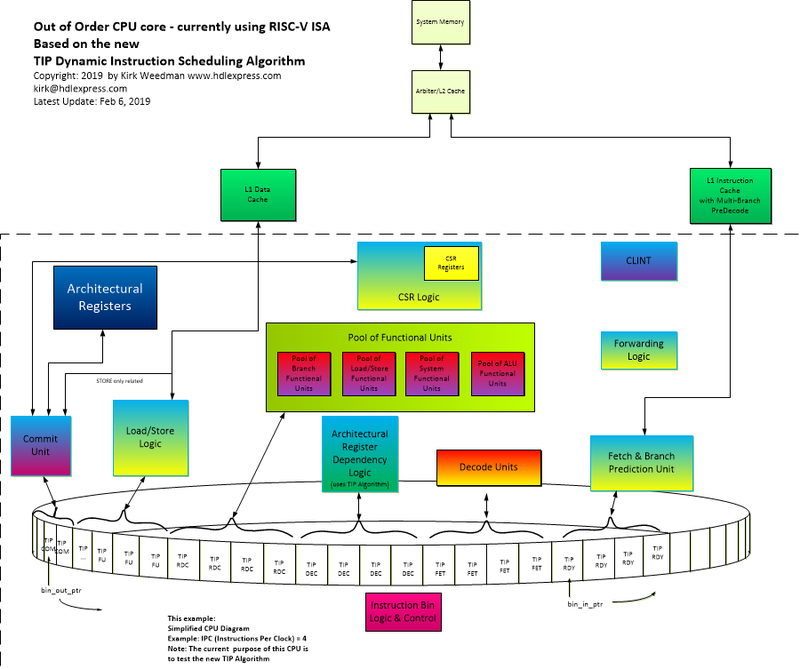 Feb 6 2019 - New block diagram of latest CPU arhitecture for testing the new TIP Dynamic Instruction Scheduling Algorithm. Although the architecture for this "test bed" CPU has gone through several changes, the TIP Algorithm has not changed and appears to be working well. 5. New L1 Instruction and Data Caches being tested.